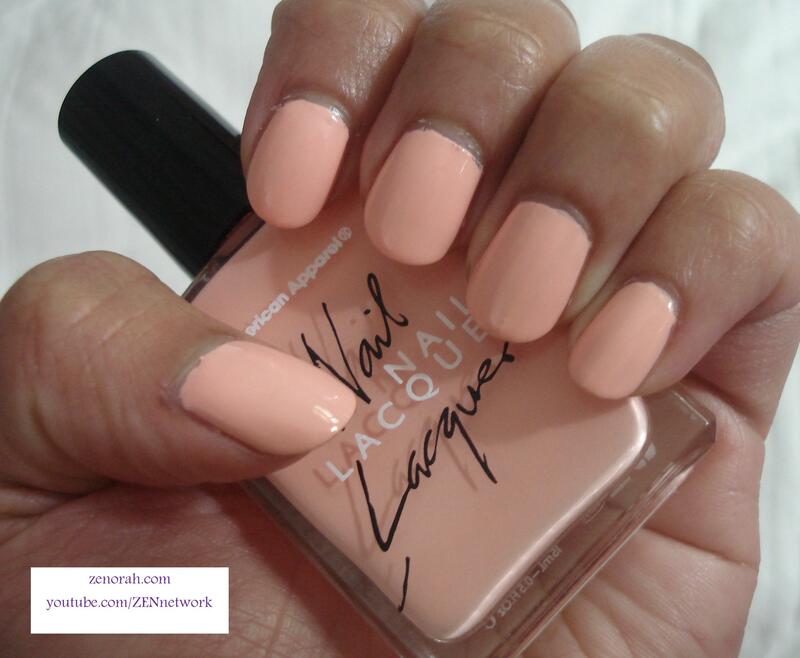 American Apparel `Summer Peach` – is a gorgeous bright milky peach creme polish. As far as I know it is a permanent polish in their main collection and I am pretty impressed with the quality and high shine finish thus far. As you will see in the remaining photos, it`s bright but still falls under the category of a `pastel`preach polish. I will be comparing it to my Essie A Crewed Interest in an upcoming post. It required only 2 coats to be opaque and lasted about 4 days without chipping – I am currently wearing this on my toes and it is definitely a gorgeous pedicure colour as well. Due to the pastel-milky tone to this polish it gives you an effortless tan as well so this would be a wonderful resort or vacation polish that has potential to act as a coloured-neutral. This may be my favourite peach polish thus far in my collection however the only thing that took getting use to was the long brush handle – that is easily overlooked by the quality of the polish and the colour though. I will be wearing this one all summer long & will definitely be purchasing more American Apparel polishes in the future! Do you own American Apparel ‘Summer Peach’? What are your thoughts on this nail polish? this color looks incredible on you! i’ve been wanting some american apparel polish for a while now and this polish is pushing me even harder! thanks Holly!! =) You should give it a try, I have a couple American Apparel polishes on my wish list now. I am pretty impressed with this one thus far! would look gorgeous on you!! It is!! thank you hun would look gorgeous on you!